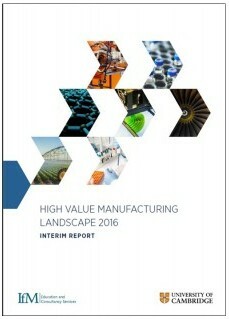 Landscape published by the IfM, this new study looks at the UK’s high value manufacturing landscape over the next 15 to 20 years. Its aim is to help UK policymakers, manufacturers and researchers make decisions about how best to support the growth of HVM. The UK is a major competitor in the global manufacturing economy. HVM report Manufacturing which generates the highest value - High Value Manufacturing (HVM) – generates significant growth and economic benefits for the country. In 2014, it contributed £275 billion to the UK economy. Building on the 2012 High Value Manufacturing Landscape published by the IfM (on behalf of the then Technology Strategy Board, now Innovate UK), this new study looks at the UK’s HVM landscape over the next 15 to 20 years. Commissioned by Innovate UK, this work has been designed to take account of the new insights and capabilities that have been developed since the previous work, and to focus more directly on the challenges facing manufacturing industries. The aim is to help the UK’s policymakers, manufacturers and researchers make decisions about how best to support the growth of HVM.